Discussion in 'The Rapture, Bible Prophecy, and End Times Chat' started by John Romans, Apr 14, 2019. I wrote this article before going out of town for several days, so most of it is not about current events (there are some current events at the end of the article). In Old Testament times there was a wall around the city of Jerusalem, and there were several gates in that wall. One of those gates was called the Eastern Gate (It was also called the Golden Gate, the Gate of Mercy and the Beautiful Gate). The Lord was saying that there will come a time when the Eastern Gate will be shut because the Messiah passed through it (Jesus passed through it at His Triumphal Entry), and no one will pass through it until the Messiah comes back. In 70 A.D., the Romans destroyed Jerusalem and the Temple. In 1517 A.D., the Ottoman Empire (the Turks) took over the Middle East. At some point in the 1530’s or 1540’s, the Turkish ruler Suleiman the Magnificent heard that the Jews believe that their Messiah would come from the east and pass through the Eastern Gate (Christians believe this will be Jesus’ Second Coming). Suleiman didn’t want the Jewish Messiah to pass through the Eastern Gate, so he ordered his people to shut it and seal it up. They closed it in with bricks, but that was just one part of the prophecy. The other part of the prophecy said the Eastern Gate will remain shut until the Messiah appears and passes through it. In 1967, both Jordan and Israel almost opened the Eastern Gate; but both nations failed, and the Eastern Gate is still shut. Jordan controlled East Jerusalem. Jordan’s king wanted to open the Eastern Gate and build a hotel against the inside of the wall so that people could enter his hotel through the Eastern Gate. Jordan’s king sent workmen, equipment and materials to the Eastern Gate to knock out the bricks and open it up. The workmen moved their equipment and materials to the Gate and left it there for the night. They intended to go back the next day to break the gate open. That night, the 1967 war between Israel and Jordan broke out, and Israel captured East Jerusalem and the Temple Mount. The king’s crew could no longer break open the gate, and his hotel never got built. The 1967 war broke out, Israeli troops captured the Temple Mount, and some of Israel’s military leaders wanted to blow open the Eastern Gate to send tanks and troops through it for an attack on Jordan. Other Israeli military leaders were aware that the Scriptures say that the Gate will remain shut until the Messiah appears and passes through it. Israel’s military leaders discussed blowing open the Eastern Gate, but the leaders that were familiar with the Scriptures won the debate. Israel attacked Jordan from a different location. The Jordanian troops were caught by surprise, and Israel won the war. Since capturing it, Israel has not allowed the Eastern Gate to be opened. Following the 1967 war, Israel agreed to let Jordan administer activities on the Temple Mount, and Jordan agreed to let Israel be in charge of security on the Temple Mount. The two nations also agreed to maintain the status quo on the Temple Mount. In 2005, the Palestinians tried to occupy an area on the Temple Mount just inside the Eastern Gate. Israel wouldn’t allow the Palestinians to occupy that area, and the Palestinians rioted. The disagreement went to court, and a judge ordered the area next to the Eastern Gate closed to everyone. 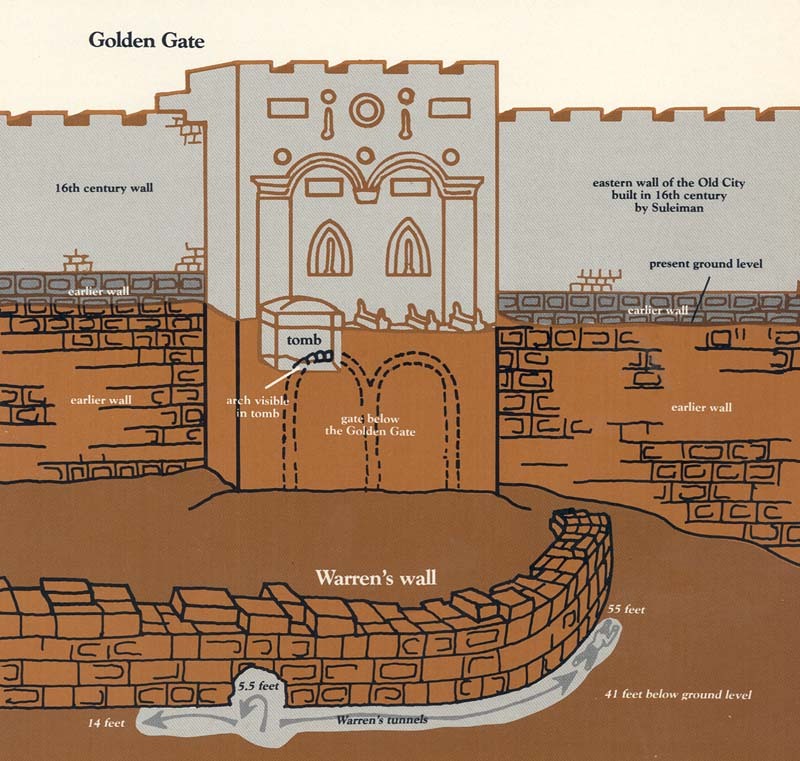 Israel installed a fence with an iron gate leading to the Eastern Gate, and access to the area on the inside of the Eastern Gate was blocked off with a fence, a gate, a chain and a lock. Calm prevailed on the inside of the Eastern Gate from 2005 until Feb. 2019. On Feb. 22, 2019, the Palestinians rioted, destroyed the lock on the iron gate barring access to the Eastern Gate, and took over the area butting up against the inside of the Eastern Gate. Rumors circulated that the Palestinians intended to build another mosque and hold Muslim prayers inside the Eastern Gate. Prime Min. Netanyahu said he wouldn’t allow it. Mr. Netanyahu gave the Palestinians until Monday, Mar. 11, 2019, to leave the area near the Eastern Gate. Palestinian leaders ignored Mr. Netanyahu’s ultimatum. A group of Jewish settlers said the Palestinians were breaking their agreement with Israel to keep the status quo by illegally opening the area inside of the Eastern Gate for a mosque and Muslim prayers. They said the status quo that Israel and Jordan agreed to no longer exists. They added that the door is now open for Jews to ignore the status quo and build a synagogue on the Temple Mount for Jewish prayers. They said the Israeli government should not agree to any settlement of this issue unless Jews are allowed to pray on the Temple Mount too. Israel and Jordan started holding high-level talks to resolve the issue, but they couldn’t reach an agreement. On Mar. 9, 2019, the King of Jordan went to Washington to seek help to resolve the issue in his favor, but it didn’t work. On Mar. 11, 2019, Mr. Netanyahu’s deadline came, and the Palestinians were still occupying the forbidden area inside the Eastern Gate. Israel had a large number of police and security forces in the area. On Mar. 12, 2019, a protester threw a Molotov cocktail at a police cart in the area. Israeli security forces closed the entrances to the Temple Mount, arrested some of the protesters, and ordered everyone on the Temple Mount to leave. There was another court hearing, and the court told Israel to keep the area closed; the judge gave Jordan 60 days to respond to the court order. I am not privy to Palestinian secret schemes and motives, and I don’t know how all of this is going to come out. But I do know that Jordan wanted to open the Eastern Gate to send in workers, material and equipment to build a hotel in 1967, and I tend to believe that opening the Eastern Gate is what the protesters want to do now. I believe their ultimate goal is to thwart the prophecy in the Bible. Nevertheless, the issue hasn’t been settled; and I rejoice over the fact that the Eastern Gate is still closed and that it could soon be opened to greet the coming Messiah. Reason & Hope, Hidden, Terry and 10 others like this. "I believe their ultimate goal is to thwart the prophecy in the Bible." Yes i agree Raymond. We know satan is behind this, because he still challenges God and feels that if he can change this prophecy, then he can change others, especially his eternal destiny in the lake of fire. What God speaks is truth. And prophecy will not be changed. It will come to fulfillment just as God said. Hidden, Terry, Spartan Sprinter 1 and 7 others like this. Great article. God willing the Gates will open soon! To add to the article: we only see the upper part of the Gates of Mercy. The street level has risen much over the centuries. Sha’ar HaRachamim (Gate of Mercy/Golden Gate) located in the eastern retaining wall of the Temple Mount, in Jerusalem, Israel is different from the other gates of the Old City for two reasons: the first is that it was built over a millennium before Suleiman the Magnificent rebuilt the walls and gates of Jerusalem in 1540 C.E. (A.D.); secondly, it is sealed. There are some archeologists who believe the original gate, dating back to King Herod the Great’s reign (73/74 BCE – 4 BCE) or even to the period of the Prophet Nehemiah (c. 440 BCE) still exists beneath the current gate. Today the entire area around and below Sha’ar HaRachamim contains the Yeusufia Muslim Cemetery. Across from it lays part of the Kidron Valley. In the Tanach (Bible) the Kidron Valley is called “Emek Yehoshafat” meaning “The valley where G-d will judge”. Above the Kidron Valley is the Mount of Olives on its slope is the world’s oldest Jewish Cemetery. Hidden, lightofmylife, cchomeschoolmom and 6 others like this. Hidden, John Romans, cchomeschoolmom and 2 others like this. Hidden, John Romans, lightofmylife and 3 others like this. Hidden, John Romans, lightofmylife and 2 others like this. "you corrupted your wisdom because of your splendor"
Batfan7, Hidden, cchomeschoolmom and 4 others like this. We know that Jesus' coming is a sure thing because God said so. Therefore, who's with me for the biggest celebration this universe has ever seen after Jesus returns? Someone please ask the King to come to the party! GotGrace, Batfan7, Hidden and 5 others like this. We're all with you, the sooner the better!! John Romans, MePlus6, Hidden and 1 other person like this. Rocky Rivera wrote: "Someone please ask the King to come to the party!" Every day: Our Father in Heaven, Holy is Thy Name, may your Kingdom come and your will be done on earth as it in Heaven. Hidden, John Romans and MePlus6 like this.